Lately I've been feeling bad for not posting more. Especially given all the new visitors since the NYT essay. I don't feel bad for not having lots of construction drama to regale you with, but you have to understand that it is ever so much more interesting to read about it than to go through it. Anyway, I've been away from home for the last three weeks, had finals and a crit, and besides, it's been cold and rainy. I made a few attempts at writing some more planning stuff out, but didn't get very far with it. So I had my last final this afternoon in a sunny and shiny SLO, then I got home this evening to a downpour and biblical flooding; the difference in climates is very noticeable at this time of year. Now I have a week off, and by way of apology for the extended silence and as a special treat for you, my old and new visitors, I'm going to post every day for the next seven days (can you think of a better way to spend spring break than blogging???). I have some fun stuff planned, both in terms of projects around the house and some more "big picture" stuff. If I get really desperate, I might use some of those posts I started and never finished over the last week. 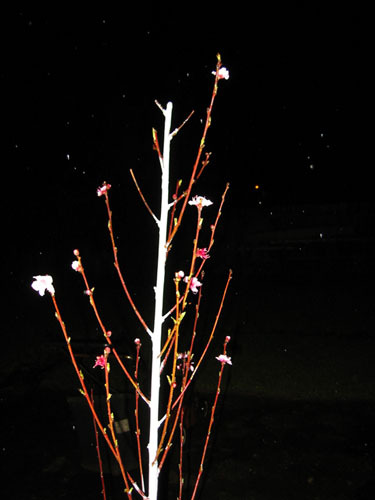 First we have the first blooms on the nectarine (Arctic Queen here) looking pretty and pink. Lots of the new plants are starting to show signs of life, especially the strawberries. I'll take more pictures when the sun comes up. The roses are still sort of sulking a little, because it has been chilly, but they should start growing like mad in the next month. 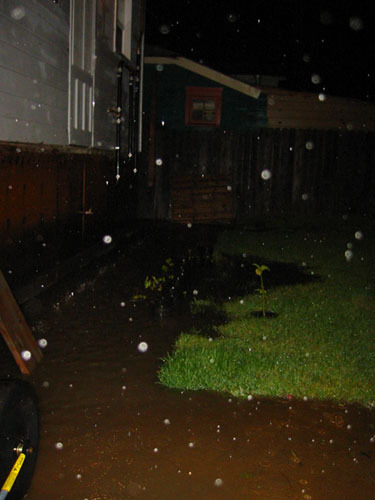 Then a view of the back of the house in the rain, all flooded. Yes, that is our back door there floating in space, and no we do not intend to put the stairs back on ever (we have other plans for the back but can't really afford to deal with the door right now, and so far nobody has called us on it). The plants there are a line of seedling grapes from an experiment I've been running, and a weensy baby brugmansia that I only just put in the ground. I certainly hope they don't mind a day or so of wet feet, because I'm not wading out there to move them. I stopped at Target in Gilroy on my way home tonight, and the plants there were gorgeous. I bought three ranunculus and an Icelandic poppy, just on impulse, and was hoping to be able to nip out back and plant them tonight, but that is not going to happen. Maybe tomorrow or Saturday.